The first time I laid eyes on Gavino’s donuts, I was already intrigued primarily because of its shape. I also wondered about the taste. There was a caption in the store that says “Japanese donuts,” and that got me more interested. How do Japanese donuts taste like? 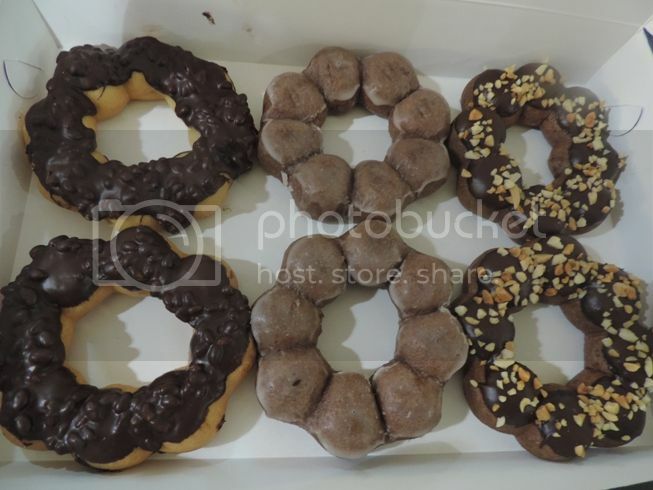 What makes them different from the other donut brands we Pinoys have grown accustomed to? And so I bought two flower-shaped donuts (chocolate flavor) for my son’s school snacks one day, but I wasn’t able to try them because he went home with an empty lunch box. Lol! I went there again last week to buy a few pieces to make sure that I get to sample at least one of these donuts from Gavino’s. I bought a dozen donuts from Gavino’s consisting of three different flavors: Choco Crunch, Chocolate Glazed and Nutty Chocolate. Each of the donuts I bought cost Php29.00, but I paid only Php162.00 for half a dozen, giving me a savings of Php12.00. Gavino’s donuts are Pon de Ring donuts. They’re soft and chewy mochi donuts that are shaped like a flower. These donuts are very popular in Japan. How do I find Gavino’s donuts? I liked them. I realized that it’s actually more fun to eat chewy donuts. While it takes longer to finish eating a mochi donut, it actually allows one to relish the taste and really enjoy its chewy texture. The shape is so intriguing how much more the taste of it. A must try donut indeed. yummy! I saw the stall before but not yet dare try will do now thanks for sharing.